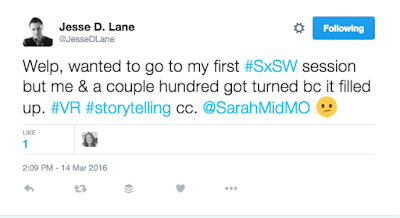 If we had a dollar for every time we heard the words "early days", "empathy" or "immersed" this week at SXSWi, I might have enough money to buy our Hololens! +Jessica Brillhart , Google's Filmmaker in Residence, has developed a drinking game. So every time you hear or read one of those buzzword words, please encourage your immersed brethren to take a drink! The darling of VR at SXSW 2016 wasn't an app, but the renaissance of an old medium. 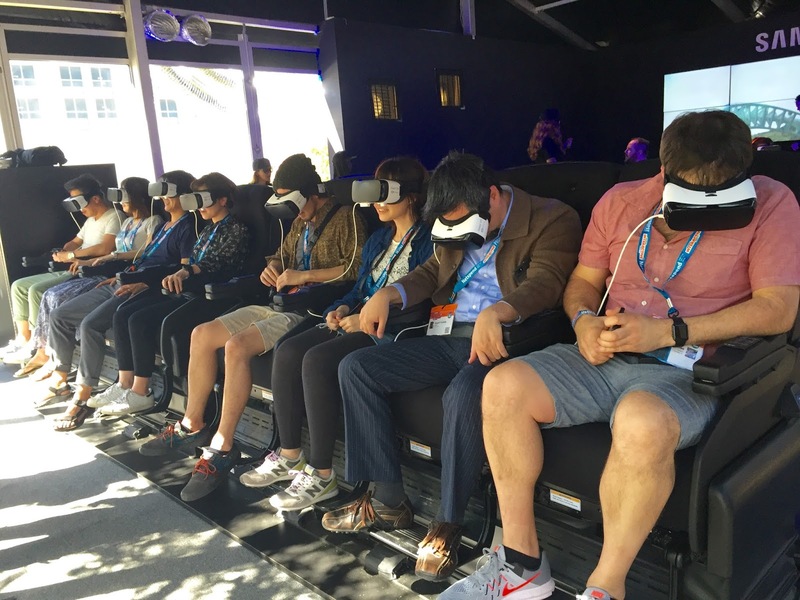 VR was "the thing" at this year's SXSWi with headsets cropping up at trade show booths, sidewalk cafes and even pedicabs. The VR panels were packed and at one session, "hundreds" were reportedly turned away due to capacity. View from our SXSW Panel on Empathy. I know, we used the "E" word. Drink! Here's what else you missed in Austin. Chris Milk gave a session to kick off the VR/AR track. Lots of Big brands like Anheuser Busch are using VR to allow people to step inside their breweries. Tilt Brush was on display at Google's VR mixer. Thrillbox launched at SXSW, a behavioral analytics platform. Other startups like Retinad were experimenting with heat maps for VR analytics. Sulon Headset: Just as mobile VR is taking off, along comes a new category...All in One VR. This product by AMD connects to your PC via wifi and is an untethered experience. Entrim 4D Headphones: Here's what happened when I tried these Vestibular headphones on a simulated race track. The video was moving me. At our panel on VR as an empathy tool, (drink!) we showed a sneak peek of our "Zambia: Gift of Mobility" story that will come out on the Washington Post. We also talked about old school distribution where StoryUP street teams are sharing Virtual Reality with people who aren't able to physically travel. We are losing our World War II Veterans at a rate of 500 a day nationwide and most will die before they've had the chance to see their memorials. Check out http://honoreverywhere.com/ and sign up to share virtual reality with someone in your community. Lots of WebVR startups were looking to be an alternative to flat apps that viewers have to download. VRmaster and InstaVR were two I saw at SXSWi. Both allowed you to embed hot spots within video. This is fascinating to me as it could reduce the barrier to entry for VR content. Apocalyptic VR: One session explored the backlash that VR might receive. 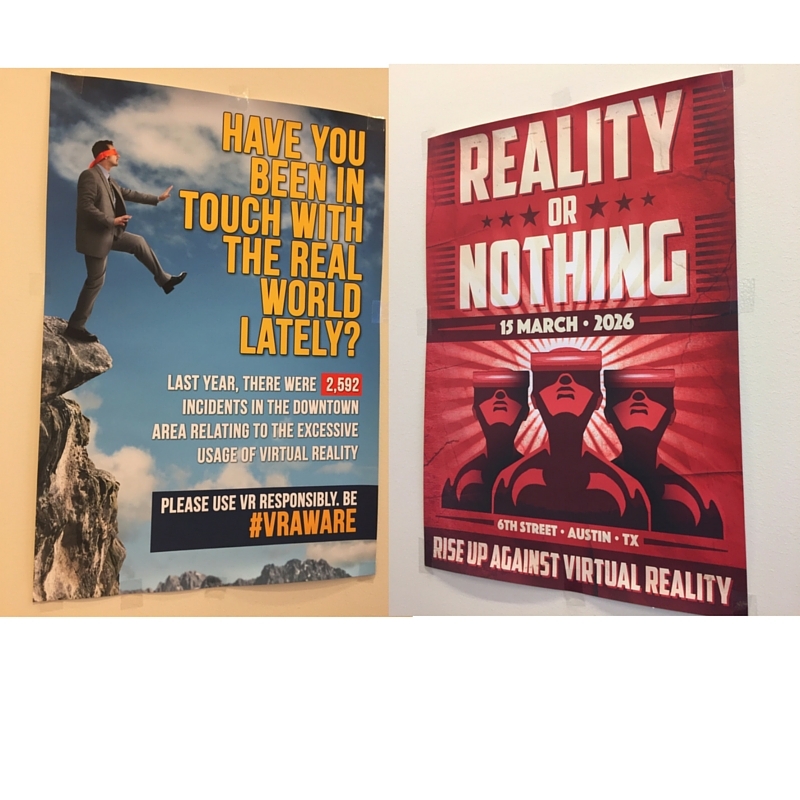 These fictitious posters scattered around the room seemed straight out of Ready Player One. In the words of Jonnie Ross from VRLA, we are turning a really big corner. "It's fast and it's gonna get weird." Weird it was in Austin. It seems VR is a "whole new medium." Drink! What other words have you heard that you'd like to add to the VR drinking game list? StoryUP is a VR Storytelling studio based in Missouri. Keep up with us by subscribing to our blog. Hire us by visiting: http://www.story-up.com/.